Hello there! 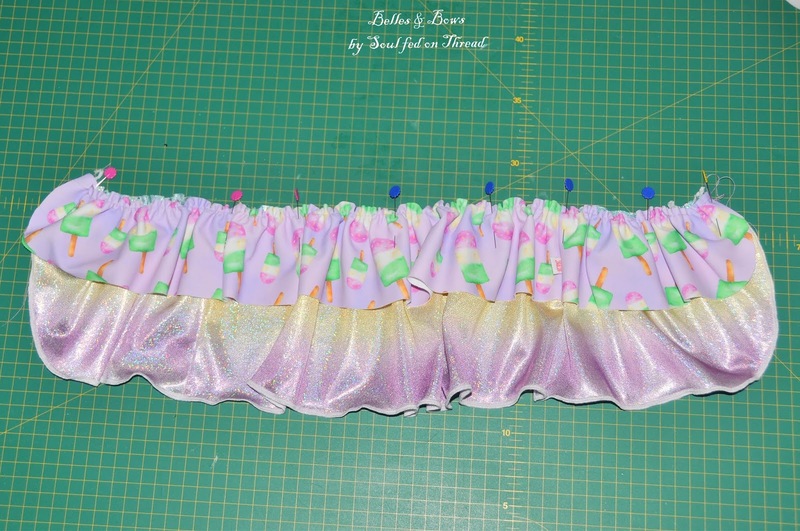 Welcome to day 3 of the Sems L&K swimsuit sew-a-long with Sansahash patterns. If you're only just joining us, please check back in on DAY 1 and DAY 2 to catch up. Today we are finishing off our tops! How fast did that happen?! Turn up your elasticated hem and top stitch with a zig zag or double needle. Press your racer bikini with a gentle iron (and a pressing cloth if required.) 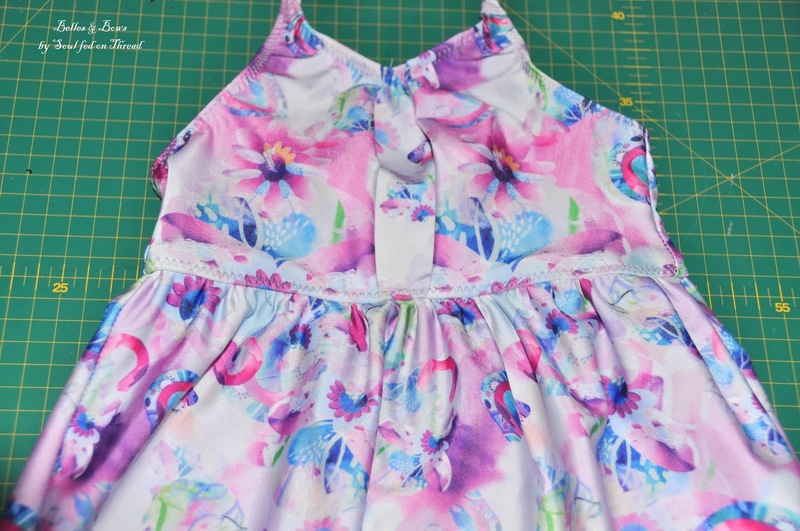 Top stitch the neckline and armholes using a twin needle or zig zag stitch. Ta daah! Now your L&K racer back bikini top is complete! 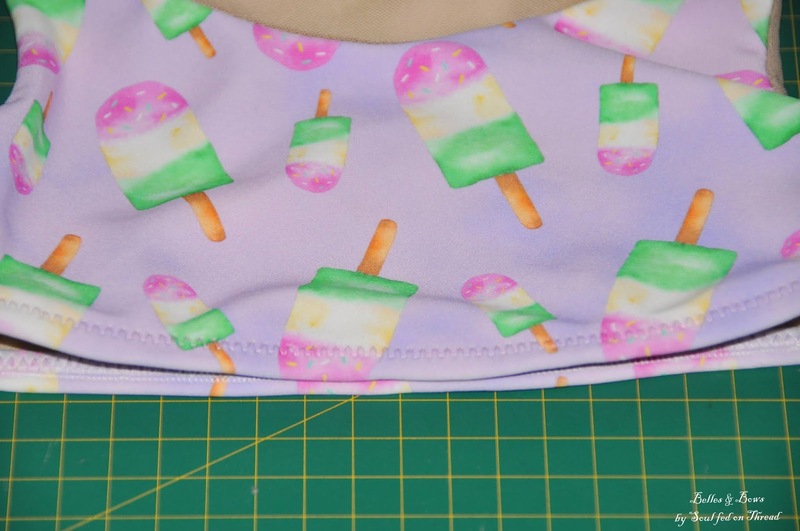 Stitch in top elastic. Ensure you find the centre of the front top and front elastic pieces. Pin and sew carefully. 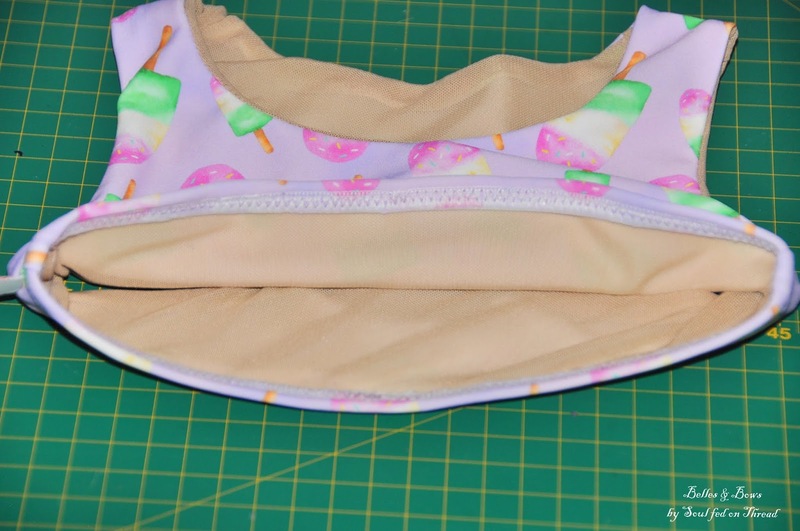 Quarter the larger side/back elastic and top, pin and sew and ensure your top is not stretched, your elastic will need to be stretched slightly whilst sewing. Fold your strap pieces right sides facing, sew long edge, leaving a gap between the marks you made when cutting out your fabric. Note the gap, you will need to leave this gap in both straps. 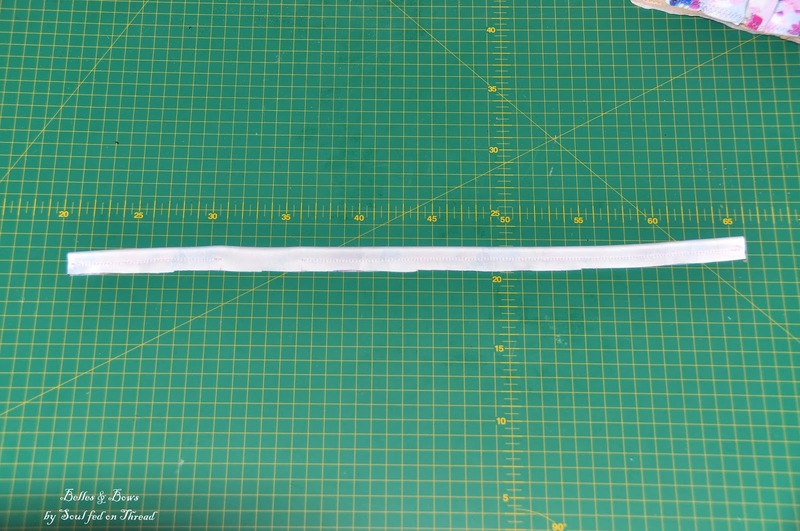 Turn the long portion of your straps the right way out - use a turning tool like I have, or check the Sansahash blog for tips HERE on turning straps. 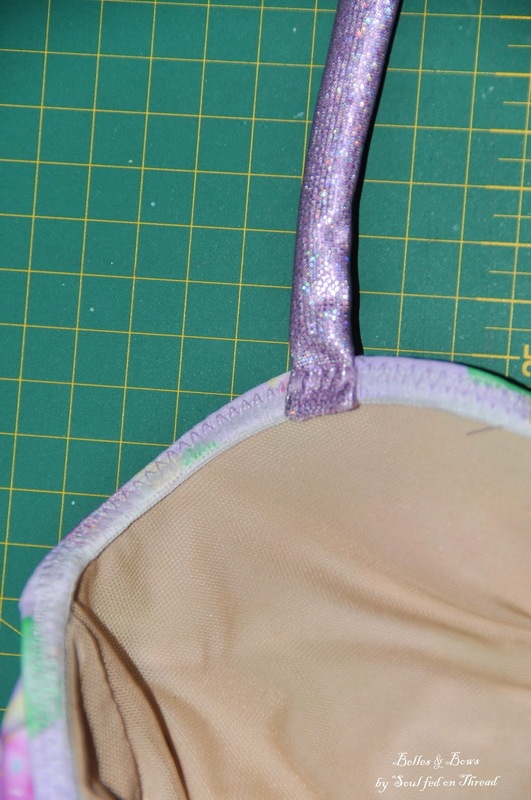 The short part of your straps will remain wrong way facing. 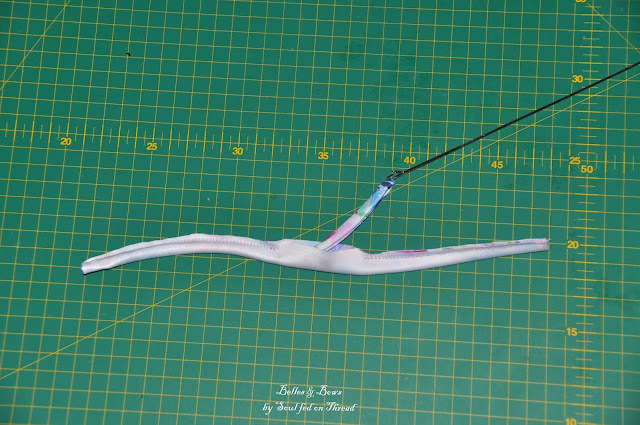 Follow the tutorial carefully for this next bit if you're unsure of what the heck is happening here! However, pop on a small safety pin on your bodice where your first strap will attach. 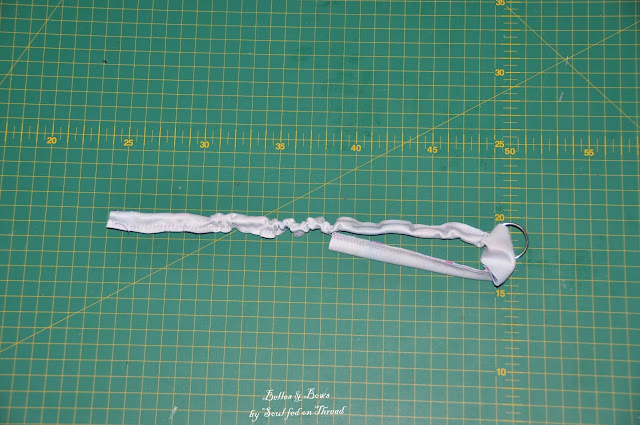 Next, slide over the short end of the strap (the piece that is still inside out.) 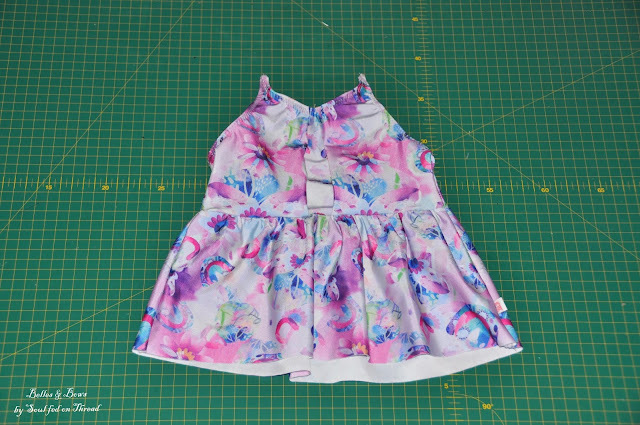 When the ends meet, stitch the strap to the bodice, unpin the safety pin and trim seam allowance. Pull the strap up and over the seam. Now your strap is attached and completely right way out. Hand stitch the opening close. 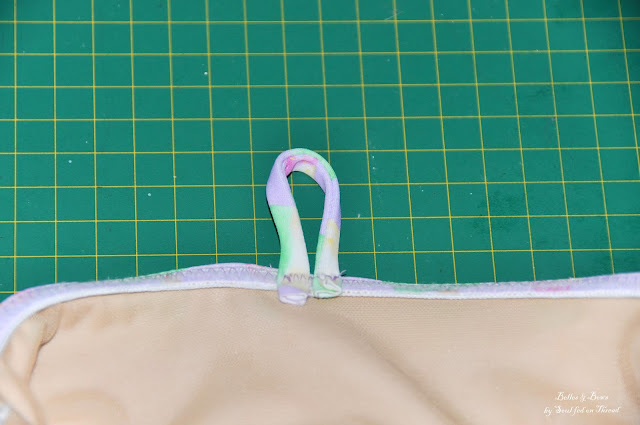 Sew or knot the end of your strap. Repeat for second strap. Gather your skirt, see this YouTube video clip HERE for a brief instruction on gathering. 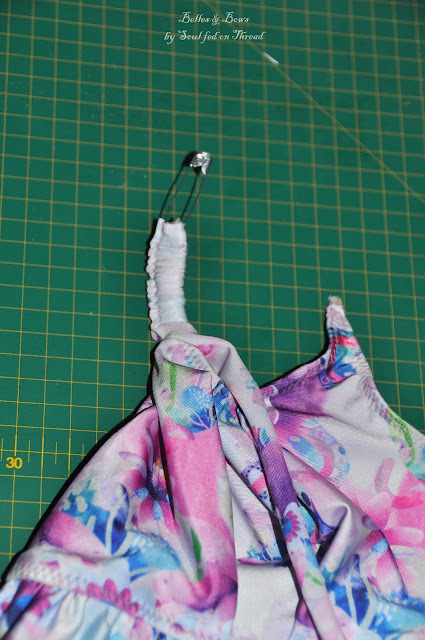 Sew on your tankini skirt using a stretch stitch. I recommend adding elastic to the inside of this seam too. 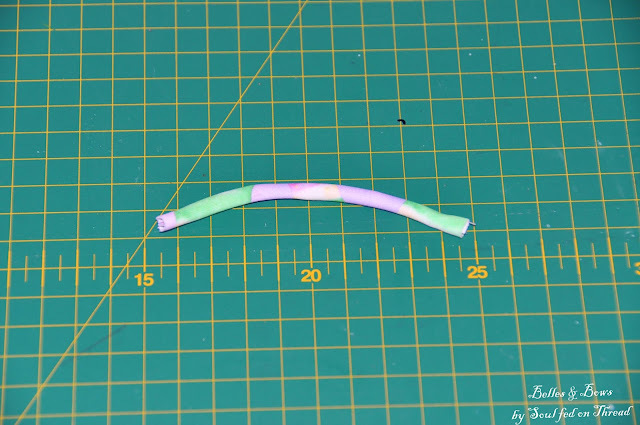 If it appears like there will be too much bulk, use clear elastic instead. 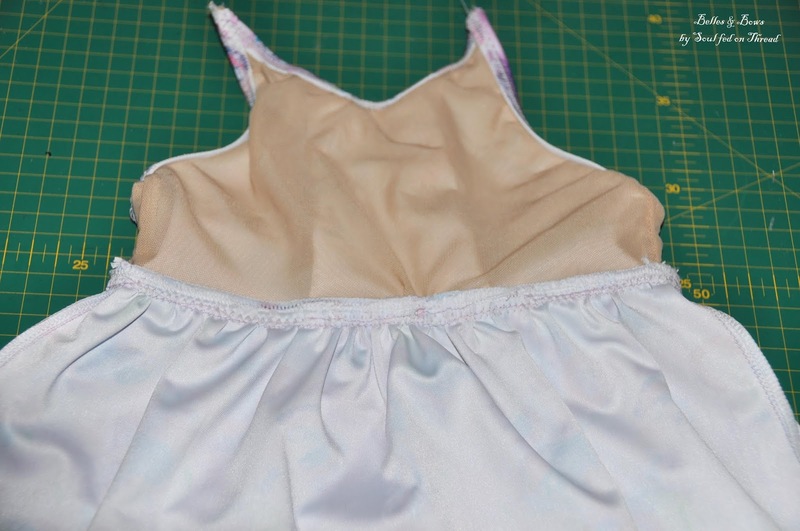 Press top gently and top stitch skirt down using a twin or zig zag stitch. Great work!! 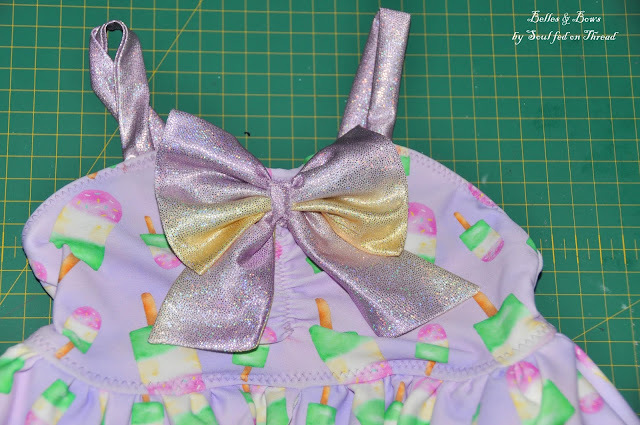 If sewing the pleated bikini or tankini version, you've now completed the top! 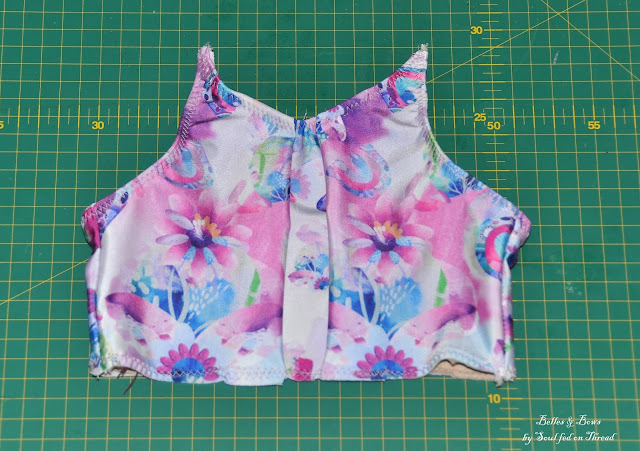 This version will follow a similar line of steps to the pleated version, however, YOU will need to measure the top of your bodice carefully. Do not just measure across the bodice chest area, follow the curves around. 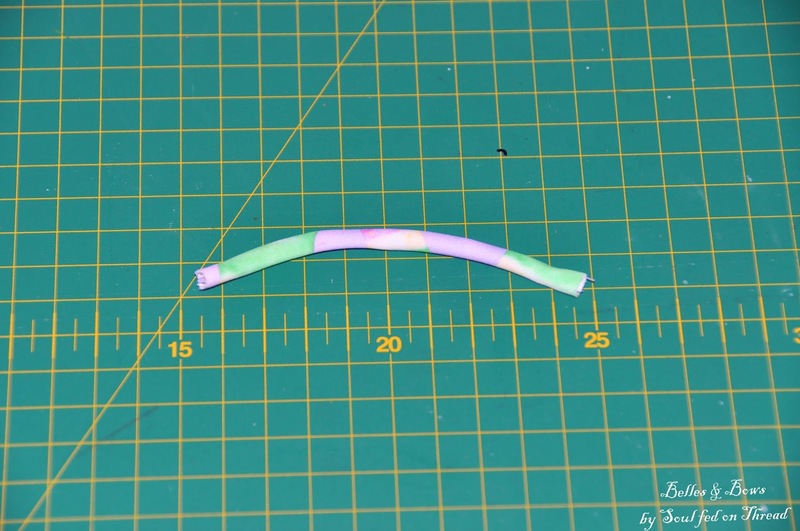 Once you have a number, cut a piece of elastic 95% of that size. For example, if my measurement was 54cm, I would multiply 0.95 by 54, this gives me 51cm (rounded.) 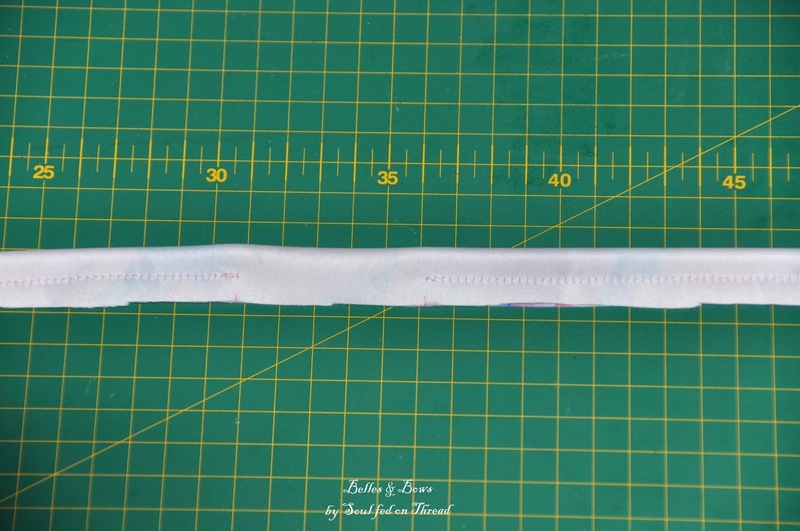 Over lap your elastic 1cm (1.4"), divide into quarters. 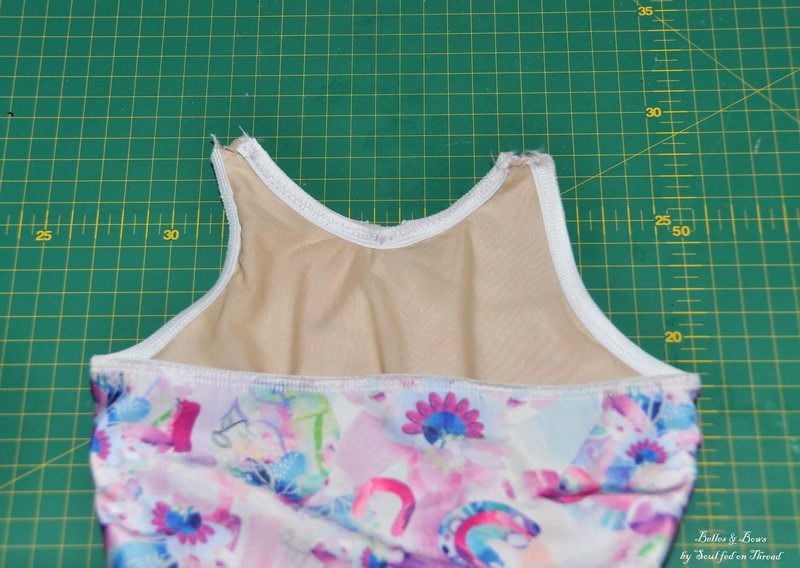 Divide your top bodice into quarters and pin carefully. 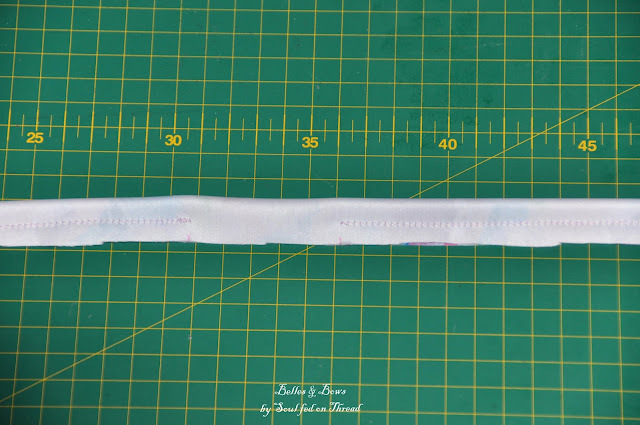 Sew on your elastic by gently stretching elastic WITHOUT stretching the fabric. 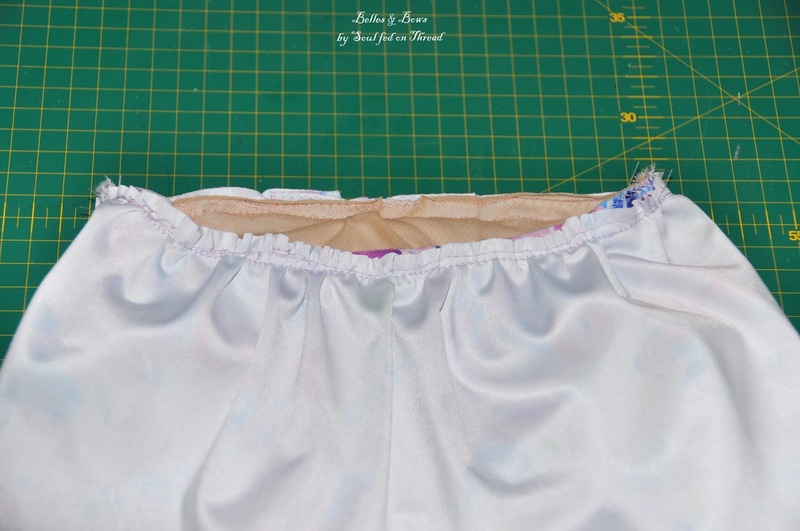 Turn over elasticated hem and top stitch with a zig zag or twin needle. 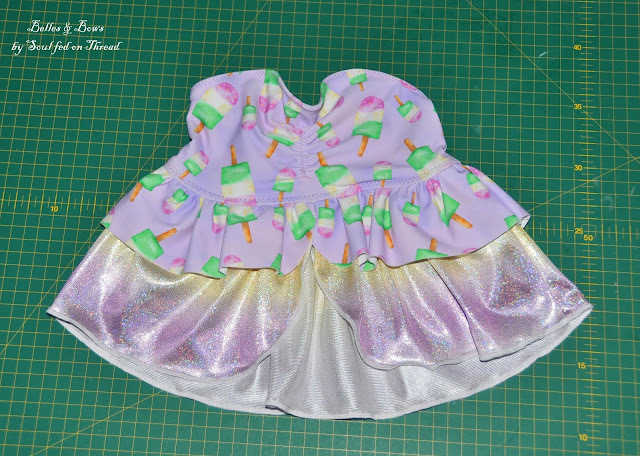 Gather the ruffle skirts to fit the tankini top. Baste both skirts together. 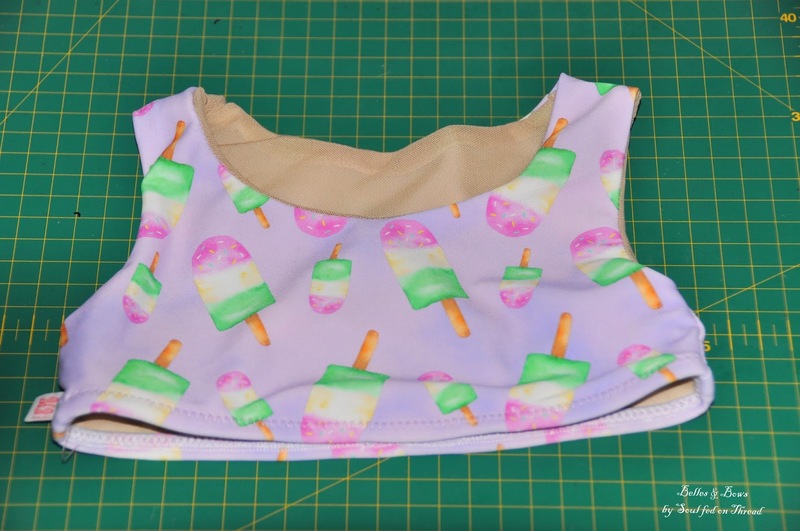 If you would like a tankini that ties at the back (instead of a halter neck tie) sew your back tie piece right side together down long raw edge. Find the centre back of your bodice. Make a loop with the back tie and stitch on. Unfortunately I haven't devised a pretty way to attach these straps. To find the best spot to stitch these straps, have your model (the smaller person who will wear the swimsuit) try on the top. Mark these spots, stitch on straps. 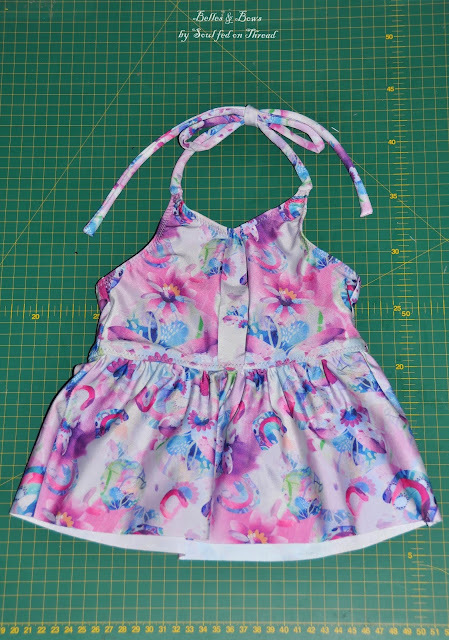 Now your ruffled tankini top is finished!! Phew!! Go you!! With tops complete, we will now be moving on to bottoms! Stay tuned for day 4 starting Tuesday 22nd January 2019. Please share your progress with the group and ask any questions. We are very excited to see your work!